A Missouri daycare center is facing heat after released video footage showed a teacher throwing a 3-year-old girl against classroom cabinets Feb. 1. The girl had to have seven stitches after her head was split open, according to ABC News Wednesday. The girl also stayed in the hospital an additional three days after the wound became infected, the family’s attorney Jennifer Hansen told The Daily Caller News Foundation over the phone. Surveillance video from the daycare, obtained by TheDCNF through Hansen, appears to show the teacher grabbing the girl’s hand before throwing her against the cabinets. The daycare’s director fired the teacher after watching the video, but did not see the tape until the family was there, according to Fox 2. “All teachers and staff are properly trained and extremely qualified,” Hansen said in a statement. Investigation is ongoing, according to police. 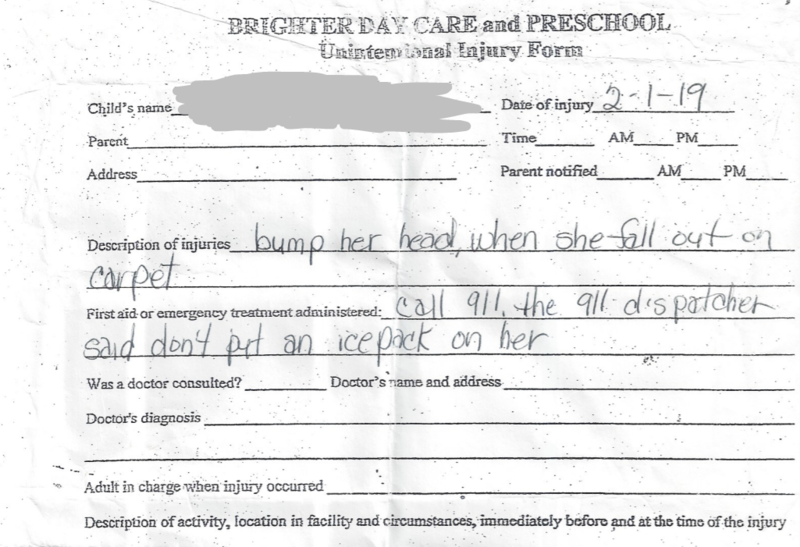 This Missouri daycare center has reportedly had other incidents in which children got hurt. A teacher allegedly slammed a child “down on a cot” in May 2018, Fox 2 reported. Daycare workers also allegedly “did not have a preventative plan in place” when one kid was choking and beating up another child. Brighter Day did not immediately respond to The Daily Caller News Foundation’s request for comment.